Quality Control ｜ Ena Optical Mfg.Co., Ltd.
during recent years, more and more factories are fully-automated. On the other hand, some factory keeps time-honored way of production. We are not stick to one side of them. We mixed these styles to create the best products. Some processes are done by highly-efficient machines. And the other elaborate processes are done by skilled craftsman. We are working toward for a best quality in this way, fulfilling the customer’s requirements. We have many fully-automated machines like the measuring instrument for the lens. To keep the stabilized high quality, production quantity and efficiency, we use advanced machines. We implement the manualized maintainance regularly, and train for the urgent mechanical troubles. 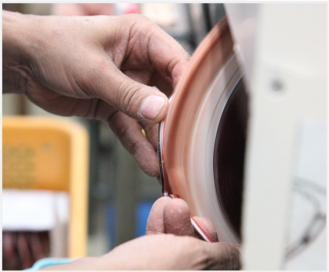 Keeping the best production condition enables to supply the quality products for our customers. However the factory introduces sophisticated technology and machines, it is human’s eyes, hands, and accumulated sensibility that actually handling the machine and finishing the products. The excellent quality results from the humans. 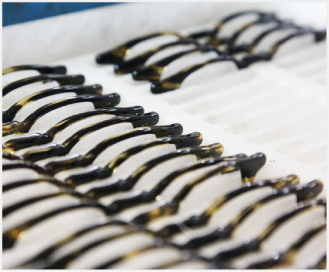 In a self-directive and activated corporate culture, we keep this as our philosophy to produce the glasses frames which meet or exceed customer’s specifications. All of our products are made in our own plant in Japan. And all the departments, including production department and Planning, Development and Preproduction department, are in our headquarters office. 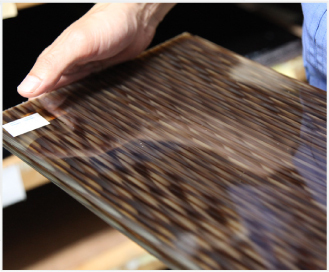 We are working in close cooperation with the other departments, and produce our glasses frames with world’s best quality.